1988, near Rotherham, in England, two young guys, Dave Crummack and Craig Galley. Craig remembers: « Dave and I "invented" it, I use the term loosely because it is very derivative of reversi, etc. We started out with the concept of designing a board game that would work better on a computer than on a traditional board. We played in the evenings over a period of several weeks with paper pieces on a chess board tweaking the rules, but it kept coming back to the same simple set of rules, spread 1 square, twinning the piece, or jump 1 square, without twinning, and capture (or infect) the nearly pieces. 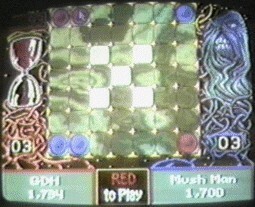 Once the game was put on the computer it was easy to see it worked well, control of the board could change very rapidly and often came down to setting yourself up correctly for the last few moves. Infection was programed on three platforms, Amiga, Commodore 64 et Atari ST. In 1989, with Dave and Craig, Mark Incley (programming) and David Whittaker (sounds) released Infection on Amiga, Spectrum (Sinclair), Amstrad CPC, PC, Commodore 64 and Atari ST. No one was commercially released. However, at the end of the nineties, Mark Incley put two ones available on Internet, the Spectrum one (below image) and the Amstrad one. Follow the links to know more. 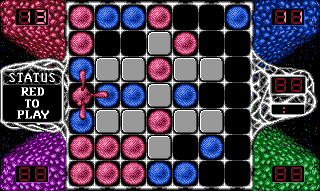 as it had just acquired rights for Spot, a character used by 7up in the US to advertise their soft drink, Infection became Spot, for PC, for Nintendo 8 bits NES and for the Nintendo Gameboy. See our pages Spot (Dos) and Spot (Gameboy). 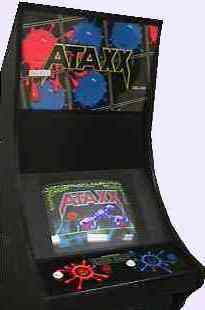 by a relationship with Leland Corporation, the rights were licensed, and Infection became Ataxx, an Arcade game. In 1992, Virgin Interactive and Trilobyte included in the 7th Guest CD-Rom game an Ataxx called Microscope, or Show of Infection, which also came from Infection (see our Microscope page). Then many other games were created from these models Spot-Ataxx-Microscope, however without using the original code of the Infection. Graeme Devine (who then managed Quake, for Id-Software) was the manager of the versions of Spot and "7th Guest" (and then "11th hour", for an Hexxagon game). 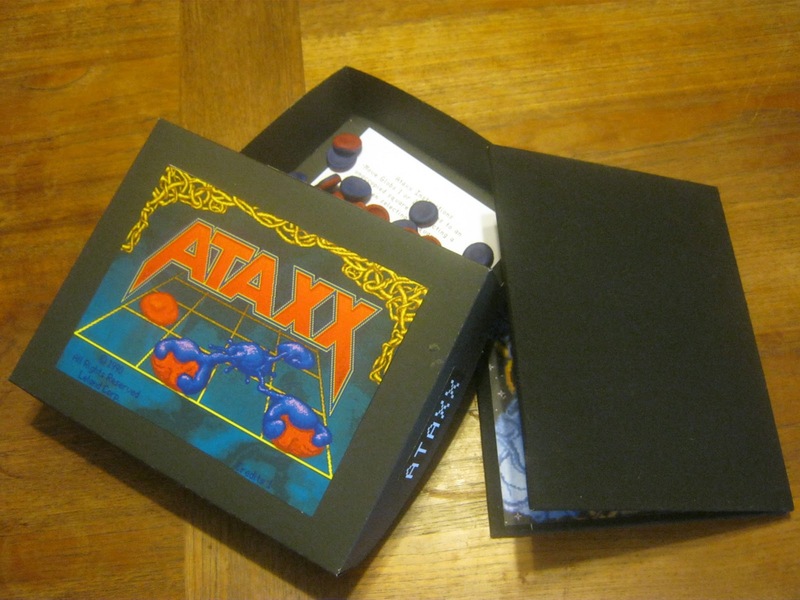 In 1990 The Leland Corporation introduced an arcade game called Ataxx. The small, black cabinet presented a very large, colourful marquee having several red and blue "blobs". The 2 player game used small track balls for choosing where you wanted to place your blob pieces. With more gore, but nothing new in the rules, it had big similitaries with the game Infection, including graphics and sound. Others informations and photos on our page about the Leland Ataxx, and also on our page about the Windows emulation, Mame Leland Ataxx. And the two inventors ? They continued on the same way, pursuing video game careers. They both moved to Austin, USA. In 2000, Dave Crummack is Director of Product Development for "Acclaim Studios Austin" and Craig Galley is Technical Director and Co-founder of "Inevitable Entertainment, Inc". Inevitable ? 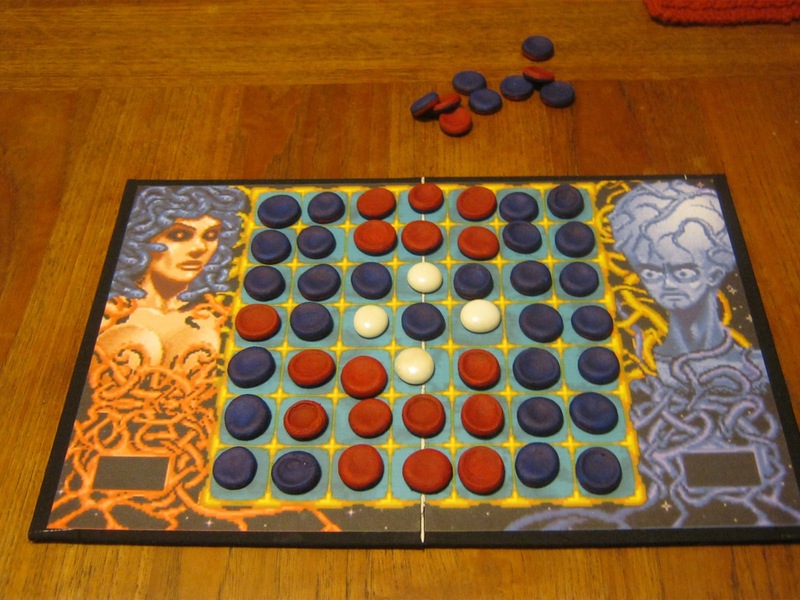 Was'nt Ataxx inevitable, for mixing reversi and checkers ?